The doctors and staff at this practice are committed to providing high quality healthcare and services to patients. If you have a complaint or concern about the service you have received from the practice, please let us know. 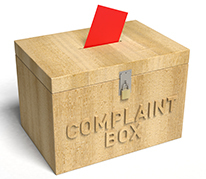 We operate a complaints procedure as part of the NHS system for dealing with complaints. The practice complaints procedure meets national criteria. It is best to tell a member of staff about any concerns or problems as soon as they arise and we will try and sort them out. If you wish to make a complaint, please let us have details of your complaint in writing as soon as possible so we can find out what happened. You can ask to speak with Tara Finnie in order to discuss your concerns. She will explain the complaints procedure to you and make sure that your concerns are dealt with promptly. It helps us if you can give us as full details as possible about your complaint. You need to make your complaint within 12 months of the incident that caused the problem OR within 12 months of discovering that you have a problem relating to a specific incident. We will contact you about your complaint within three working days and discuss with you the best way to investigate it, including the time scales for a reply. We will aim to offer you an explanation within that time frame, or a meeting with the people involved. Apologise where this is appropriate.